Here's a profession that doesn't pop up at career fairs anymore. The thing is, because of the lack of public support for gallows these days, we're losing all sorts of insider information that only executioners used to know. For example, no one can figure out how to pull off those cool masks they used to wear. Did they apply eyeliner under the eye holes to make themselves look extra intimidating to the condemned? Also, how did they deal with stage fright? Back in the day before television, people swarmed to public executions like it was the Super Bowl, so if the professionals on the gallows didn't work their ax just right, all those rotten cabbages and tomatoes could be aimed at their leather hoods. So they had to get it right, or else. Executioners, however, are famously tight-lipped, kind of like magicians but scarier. So we don't really have much of a record of what those executioners actually thought. Maybe we should assume that their grisly, intimidating leather outfits were the reason they could stay chill in front of a bunch of angry peasants. You'll look like the picture of strangely alluring terror when you throw on this belted tunic with its wet-leather look. 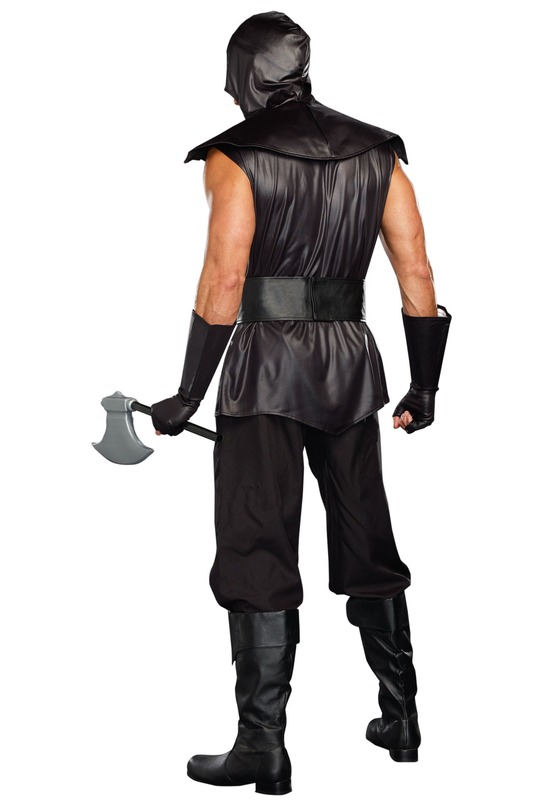 The tunic is sleeveless and has pointed shoulders and an attached hood to keep your dark identity secret. 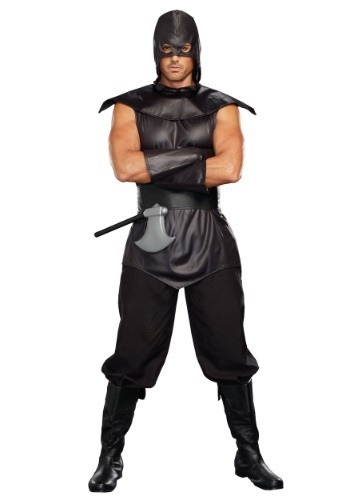 While you'll have to choose your own pants to pair with this look, the hood, gauntlets, and the ax are all included so you'll be ready for your Medieval interview. If you've been looking through our costumes looking for something with a little flash that still makes people shiver in their boots, as befits Halloween then you've found your final destination. When you're rocking this black ensemble, you'll feel like a boss. There might not be a lot of demand for this profession anymore but that doesn't mean you can't rock the gallant gallows look!